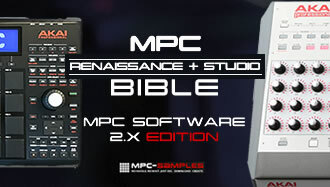 With the release of MPC Software 1.5, people were also prompted to update the ‘firmware’ inside their MPC Renaissance or MPC Studio. So, what is this firmware? Basically it’s special software stored directly inside your actual MPC hardware controller which (I assume) deals with any task related to the hardware itself (e.g. power control, screen functionality, etc) – this is different to the ‘MPC software driver’ which is installed in your computer and deals with the USB and audio communication between the MPC and the computer. Connect your MPC via USB and launch the MPC Software – if your firmware needs updating, you will receive an on screen alert. Close the MPC app. Connect the MPC to your computer via USB and power on your MPC. If it doesn’t work, repeat again from step 7 onwards. If you are still having problems, consider contacting Akai but also check out the various topics at MPC-Forums.com where people are giving advice on how they finally managed to get everything working. I’ve updated the new version of the MPC software 1.6, and it ask me to update the firmware and I updated it, and now I don’t have any plugins that I had already installed. When I go to plugins, it shows a red triangle with an exclamation point next to plugins, and it doesn’t show up all my plugins like the wub, the bank, the 809 and the noise, nothing pops up when I click on plugins. And also, when I re-open the MPC software, the same message about updating the firmware keeps popping up when I launch the software. I’m also having the same problem! Did you ever get your mpc to update the firmware ? ?